The Minnesota State Fair opens Thursday for a 12-day run. And while there are more than 3,000 fairs in North America, Minnesotans have long claimed that their annual state fair is one of the best. Many people say they're right. 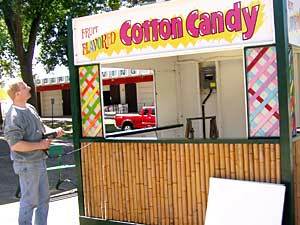 Falcon Heights, Minn. — Mark Kopek and his family have run a cotton candy stand at the Minnesota State Fair for most of the last 20 years. And they're back again this year. "We've done some other fairs. But this is the nicest in the country by far," says Kopek. "Anybody who's a carny, if you will, likes to come to this fair because this is a class act. This is really is a nice fair." You might expect that Kopek, who's from Roseville, would be biased. But his opinion is backed up by the International Association of Fairs and Expositions. The association represents 1,400 fairs in North America, including Minnesota's. The association's president, Jim Tucker, calls Minnesota's state fair "incredibly outstanding" and "remarkable." "The fairs that are really good and do well are the ones that have a strong volunteer base in the community that's putting the fair on, engaged the business leaders and the government leaders in the community in the fair," Tucker says. "They will embrace the latest technology in the displays, they'll have good quality entertainment. They'll have an event that reflects the community, and lives and breathes with the community, if you will." Officially, Tucker says fairs are judged by three criteria. The first is attendance. Last year, more than 1.7 million people attended the Minnesota State Fair. And if you go by the numbers alone, the industry publication Amusement Business put Minnesota at No. 3. The top two are in giant-sized Texas, and last longer than Minnesota's. The general manager of the Minnesota State Fair, Jerry Hammer, says he's doesn't worry about attendance. "If you take care of making the best presentation you can, if you make it relevant, if you bring in as many facets of life as you possibly can to contribute to this great social fabric that we have, then the rest takes care of itself," Hammer says. Hammer wants the fair to be entertaining and educational, but most of all, relevant -- for the young and the old, for newcomers as well as those who've been coming all of their lives. Organizers try to preserve the past without becoming too passe' -- and at the same time present displays that are pertinent. So the giant pumpkins can still be found in the agriculture building, but then there's the relatively new Wonders of Technology center. Hammer judges his success by the public response. "It's knowing how good a job we did, how good the grounds were, what kind of atmosphere did we create," he says. "More importantly, what did people take home when they leave, what did they learn when they were here, how did they connect in a variety of different ways, culturally, socially ... they're all part of the whole fabric." On the official scale, money matters. The second criteria for judging a fair is economic impact. Last year, organizers say the fair pumped about $150 million into the Twin Cities' economy. The third criteria is whether a fair pays for itself. Minnesota's fair almost always does, and often makes a little profit -- about $700,000 last year on a fair that cost nearly $27 million to put on. The profit went back into the fair. But no one goes to the fair for those reasons. A survey shows people are drawn to the rides, the food and the animals. And vendors like Glen Brown of California have another reason to be at the fair. "We make good money. We make good money," he says. Brown wouldn't say how much money, but says he makes as much at the Minnesota State Fair as some people make in a year.